1. Topshop Sleeveless Tailored Jacket £45.00 [x] : Sleeveless jackets are one of those things that are just so impractical but oh so stylish. I reckon my mum would protest against me buying one of these because 'Where are the sleeves?' but they look so stylish and elegant. 2. New Look Burgundy Corduroy Button Front A-Line Skirt £19.99 [x] : Button up skirts are literally everywhere and yet I still haven't bought one! I love this burgundy number from New Look with its super cool corduroy fabric. Plus it's on the cheaper side too! 3. River Island Maroon Smart Cut Out Playsuit £45.00 [x] : Playsuits are brilliant because they are just so easy, and I really love how River Island have made a very 70's but very playful playsuit. I love the oversized 70's sleeve and the cutouts! 4. Topshop Flower Patterned A-Line Skirt £28.00 [x] : As an absolute floral fan I love this Topshop Flower Patterned A-Line skirt. What I really love about it is how the floral pattern looks like it's almost been printed straight on to the skirt. 5. Jones Bootmaker Lola Ankle Boots £79.00* [x] : I've lost count of how many ankle boots I have actually owned over the year but I think there isn't really anything better to wear in August especially when they have a nice heel. I love this pair from Jones Bootmaker, especially as they're a bit of an investment piece. 6. Mango Purple Blonda Panel Blouse £49.99 [x] : I've always been curious as to why I love lace so much, but it's probably just because it's so darn pretty. I love the lace sleeve detail on this, and the colour is simply perfect too! Thank you for reading lovelies! Have you been lusting after Autumn clothes? I absolutely LOVE the playsuit!!! Me too, I have such an obsession with button up skirts! 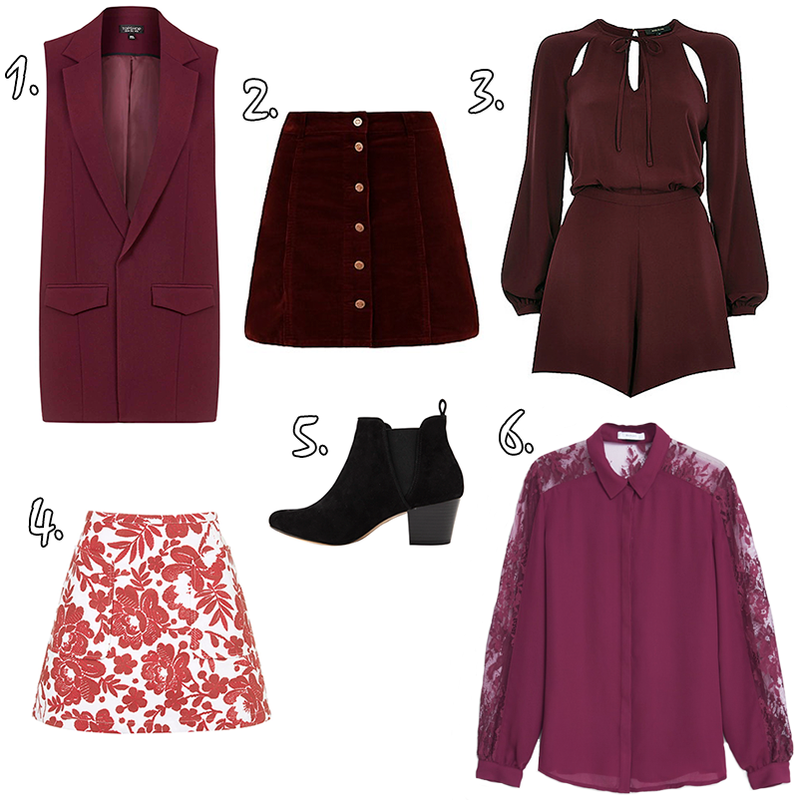 I LOVE the burgundy lace shirt - I've seen a really similar one in Primark for 1/4 of the price that I'm gonna pick up! The New Look skirt is so cute too.